Ryan and I have been trying to come up with ideas on what to do for a door for the basement bathroom. The problem we were having was that the opening to the basement bathroom is very wide but also short. The original foundation of the house is about 3 inches higher than the new foundation (the addition to the basement) so to get into the basement bathroom you first have to step up and then down over the concrete threshold. To summarize.. we have a short fat entrance to the bathroom. A normal door is much too long and too skinny. BUT while browsing the Internet one day I came across this!! Its just a door on a track that looks fabulous!!! Now we have an extra door in the house that we think we can use to make the door we want. 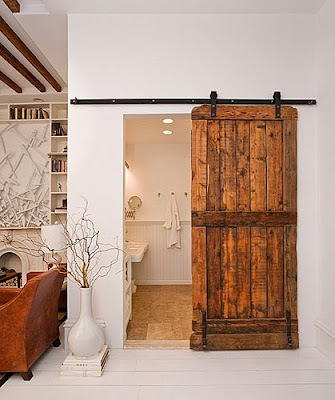 We don't plan on using a barn door. But we may just go to the restore and get 2 matching doors to have slide into place as the door (both doors would slide into the centre of the doorway to make the door which would then have a latch to lock the door). Ryan loves this idea!! Not sure how we'll make it work just yet but this is the plan for the door for the basement bathroom! !